TEHRAN, Iran (CNN) -- Trials for nearly 100 Iranians arrested in the aftermath of the disputed June 12 presidential elections began Saturday, two Iranian news agencies reported. 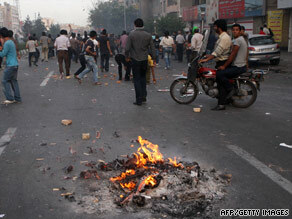 Dozens of protesters face charges in the aftermath of Iran's presidential elections. "The court, to investigate the charges against the first group of those involved in the recent disturbances, is now in session," said the state-run Islamic Republic News Agency (IRNA). "The trial of those accused of participating in the Velvet Revolution started at 9:10 a.m. (12:40 a.m. ET) following recitations from the holy Qoran," the semi-official FARS news agency reported. The defendants face a variety of charges that include attacking government facilities and setting fire to them, destruction of public property, creating panic in public and beating up members of the security forces. Hundreds of people were detained after the election won by Mahmoud Ahmadinejad. Supporters of reformist candidate Mir Hossein Moussavi took to the streets to protest what they called a fraudulent presidential election. Among the nearly 100 defendants are several members of the reformist Mosharekat Party and a member of the central committee of the Kargozaran Party, which is close to powerful cleric and former Iranian President Ali Akbar Hashemi Rafsanjani, FARS reported. A member of Parliament's special committee for monitoring the condition of detainees complained Saturday that the trials began without the committee's knowledge. "We were given no information," said Ghodratollah Alikhani, a member of the committee, according to the semi-official ILNA news agency. "Judiciary officials did not tell us anything about these trials." "The office of Tehran's prosecutor had earlier said that the court would try a number of people arrested for street demonstrations, but instead reformist activists are being tried," Alikhani added. At the same time Iran was trying the detainees, it released thousands of other prisoners after Supreme Leader Ayatollah Ali Khamenei pardoned them or commuted their prison terms, FNA reported Saturday. "Forty percent of the country's inmates, who account for around 68,000 people, were liable to the amnesty," Mohammad Ali Zanjirei, a top official with the State Prisons Organization, told FNA. He said 17,000 out of the 68,000 inmates were freed, and the rest will see their prison terms commuted or be granted leaves in the final months of their sentences. The idea was originally proposed by Judiciary Chief Ayatollah Seyed Mahmoud Hashemi Shahroudi, FNA reported. Khamenei made the amnesty on the feast of Mab'ath, which marks assignment of the Prophet Mohammad to prophethood. An Iranian legislator promised this week that the majority of the roughly 300 detainees arrested during post-election violence will be set free in coming days. Nearly 140 were already freed this week, National Security and Foreign Policy Commission member Hojjatoleslam Hossein Ebrahimi told FNA on Thursday. Iran shut down a nonstandard detention center, called Kahrizak, in southern Tehran on Tuesday on Khamenei's orders, FNA reported.